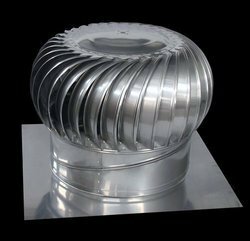 We are engaged in the manufacturing, supplying and exporting of a massive range of Roof Ventilators, which is widely acclaimed in the market. These ventilators find a vast application in workshops, warehouses, schools and ventilate factories. The offered range of ventilators offered by us has fetched wide demands among the clientele we hold. 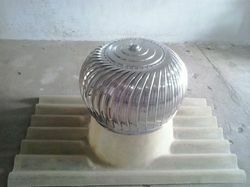 Our Air ventilator which is of superior quality . These ventilaton systems have special design that allow free flow of air and prevents the entry of water , dust and other pollutants . The system also reduces condensation and mildew . Easy to install such systems act as a guard against weather and dirt infiltration . Size 600 mm (or) 24"
Being a customer-focused organization, we are engaged in offering Industrial Turbine Ventilators. These are efficient means of extracting warm air through roof mounted turbo ventilators, which create removes hot gases, obnoxious fumes, positive draft, enhances ventilation. The offered ventilators include surface activation and have the capability to absorb water naturally, spread quickly and keep long efficiency. 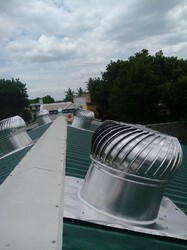 We specialize in the manufacturing, supplying and exporting of an assortment of Roof Ventilators. These ventilators are capable of improving the indoor air quality. Manufactured using galvanized metals and alloys, the entire range of roof ventilators offered by us is highly acclaimed in the market. Further, eliminating the dust penetration, these ventilators offered by us ensure a cleaner environment. Our(Air Win) ventilator series is available in four sizes with a choice of galvanized and aluminum which can be colour coated on request.galvanised we have more durability and reliable structure to withstand high wind velocity and hailstorms. Our Aluminum ventilator range carries a 5 year warranty. 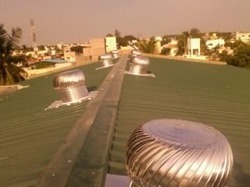 Our proficiency in this domain enables us to supply a high quality range of Roof Ventilator for Warehouse. Usage of high grade material and latest techniques in the process enable us to meet the specifications of our clients. Further, we can also provide them with customized range of ventilators. 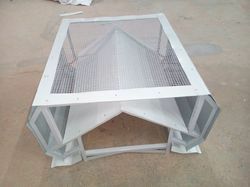 Our Wind Turbine ventilator which is of superior quality . These ventilaton systems have special design that allow free flow of air and prevents the entry of water , dust and other pollutants . The system also reduces condensation and mildew . Easy to install such systems act as a guard against weather and dirt infiltration . In case of a fire break-out, the Hurricane Ventilator ensures safety by exhausting smoke and fumes from the building. We are instrumental in availing high quality Ridge Ventilator for Chemical Industry. In order to make it as per the international quality standards, we manufactured this product with ultra grade raw material that is sourced from authentic and well-established vendors.